Three simple words, which lie at the heart of the UPL philosophy. "Doing Things Better" is all about raising the bar in global agricultural productivity. It represents an ethos statement and exemplifies UPL way of living and creating a win-win situation for all stakeholders. But naturally, this has imbibed in our CSR efforts, too! UPL's overarching commitment is to improve areas of its presence, workplace and customer engagement. This commitment is based on the recognition that humankind is one community, where each member is responsible for the wellbeing of the other. According to Bloomberg report titled “India’s Most And Least Philanthropic Large Companies”, UPL Limited is the 2nd most generous company of India in the financial year 2017-18 in terms of CSR spend as a percentage of average net profit. 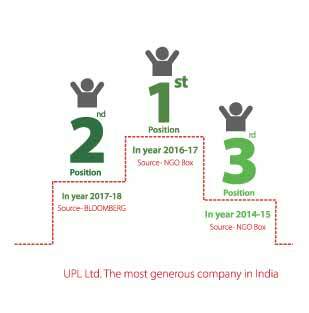 UPL Limited is in list of top 3 most generous company of India continuously for last 4 years. We aim to be a catalyst for more equitable and inclusive society by supporting long term sustainable transformation and social integration. 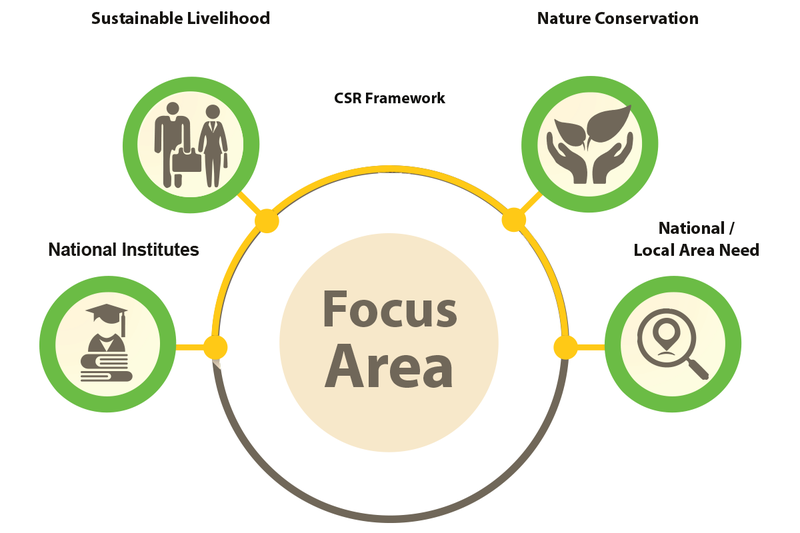 We have a CSR policy that guides the organisation and aligns its activities towards focus areas. In accordance with sub-section (1) of section 135 of the Companies Act 2013, our organisation has set up a CSR committee to advise on the company's CSR policy, and monitor the CSR activities of UPL Limited. 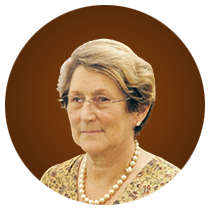 All projects are identified as per needs of community. “Arropando Vidas” which means Clothing Lives is a CSR initiative of UPL Mexico and is being carried out since 2015. Arropando Vidas is a winter campaign which consists of collecting blankets and winter clothes donated by employees/ collaborators of UPL Mexico. During this seaon,Mexico registers low temperatures. The collected blankets and winter clothes were donated on 7th Feb 2018 to 60people from the community of Tierra Blanca, Guanajuato which is one of the most vulnerable community in Mexico. In addition to what was collected by the collaborators/ employees, UPL supported by purchasing blankets so that more people get benefited. 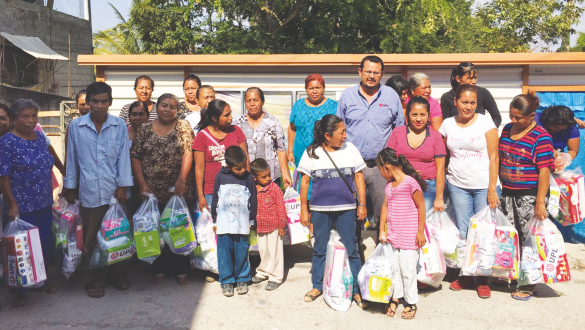 The employees also contribute in this effort (65% of the cost of blankets is borne by the employee) and the rest by UPL Mexico. The Arropando Vidas was started in 2015 and this was the 4th consecutive year of supporting most vulnerable community in Mexico. 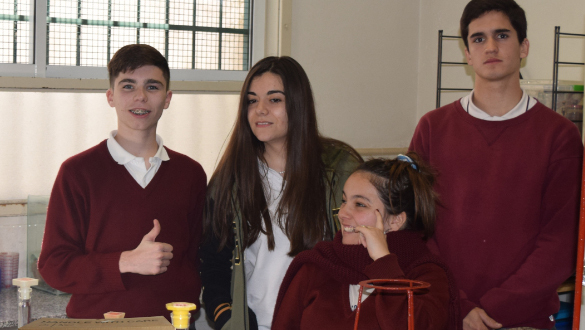 We have been celebrating Children day by a program called "Por el nino que llevas dent ro", which translates to "For your Inner child”. Every 30th April since 2015 our employees voluntarily participate in the program and distribute toys and gifts to school children. 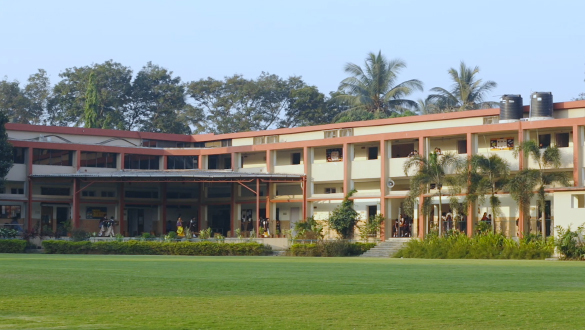 Employees also spend time with children organizing various run filled activities in the school premises. 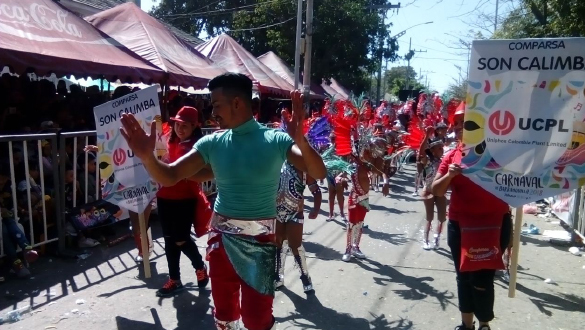 This year the event was conducted in 2 schools· The Primary School "El Plpila" In Guanajuato and Jose Maria Luis Mora School in Colonia Santa Ursula. The teachers and the children enjoyed the program immensely. At UPL, we are close to the community and for this reason. We offered an office in our plant and connectivity so that ANSES can manage from there a consultation center and access to its services for the town of Abbott Social Security office at plant for every neighbor (in the past they need to travel 46 kms to have access to social security office). This has immensely helped the community members. Learning tour of our facility for the community: We received students, teachers and authorities from Abbott's Kindergarten No. 902 in our plant. In addition to knowing the facilities and learning about our company worldwide we offered a talk on recycling and environmental care. A beautiful day of games and learning for the community. To upgrade the learning environment of the children, we donated material and laboratory equipment to schools and universities in the area. Our "Afforestation of Access to Abbott" project is in progress. Barranquilla Plant (today Uniphos Colombia Plant Limited) is located in the city's industrial sector, surrounded by 3 neighborhoods that have an approximate population of 8,000 inhabitants. With a clear approach established more than 15 years ago focused in prevention, the plant carries out interventions throughout the whole life cycle of its neighbors. The scope of its social responsibility programs includes a continuous and two-way dialogue with neighbors. Financial contribution to non-profit entities, support for the development of their emergency plans and the voluntary participation of employees. Care for pregnant women and infants, pedagogy and recreation to promote breastfeeding, nutrition and integral development of children, support to school going children, promotion of traditional culture, games, sports among adolescents and youths, care for seniors, commitment to sustainability. 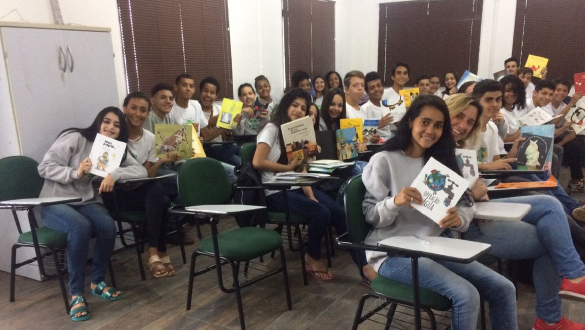 The Complimentary Education Program works with adolescents belonging to low socio - economic strata living with little or no access to health, education, cultural activities or leisure. This often leads them to child prostitution, domestic violence and idleness. We have partnered with an NGO called Association Life which promotes the social and educational development of this group so that they become creative, responsible and competent members of society. Supporting small farmers dependent on Sunflower farming for their existence. Sunflower is the second most important crop in Tanzania covering over 600,000 ha of land. It is largely cultivated by small farmers and the crop is dominated by OPVs. Working with the small farmers is a challenging task and hence, we are working with several NGOs like FIPS, Aga Khan Foundation, AMDT, SNV etc. to reach thousands of farmers. We are also working with an NGO called Technoserve, providing on field training to their farmers and oil millers and promoting sunflower hybrid. 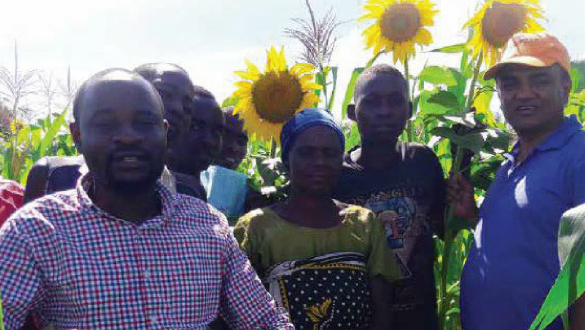 (Technoserve is an NGO in Tanzania contracted by Agricultural Market Development Trust (AMDT) to build the knowledge and capacity of the Sunflower farmers and processors to grow and process Sunflower grains as well as oil). A training programme was conducted on 14th November, 2017 by Technoserve in collaboration with Advanta & Bytrade Tanzania Limited In Dodoma (Central Tanzania). Use of traditional labour extensive technology & techniques on small land holdings and rain fed irrigation practices have made Indian agriculture not so profitable for farmers, leading them to poor quality of life and facing nutritional deficiencies and low immunity. UPL is implementing several initiatives to help the small and marginal farmers grow and develop. UPL started the farmer's training school in the year 2000 at Vikram Farm in Nahuli to impart hands on training and on field demonstration of latest farm technologies to the farmers. 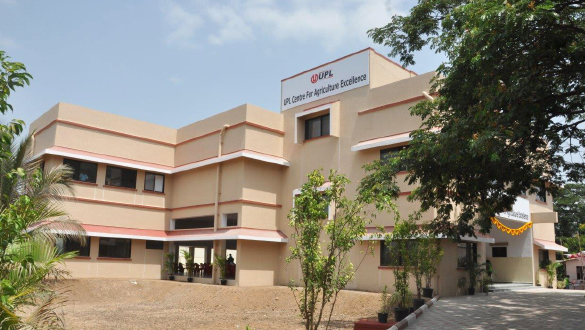 As of March 2018, Approx 14,100 farmers have taken training at UPL Centre For Agriculture Excellence, Nahuli, VAPI. Newer farm technologies and machinery have come into practice since then and a need was felt to construct a center which catered to the ever evolving needs of the farmers. A state of art center call “ UPL Centre for agriculture Excellence” was built in 2017 and was inaugurated by Hon'ble Union Minister of State for Skill Development- Shri Rajiv Pratap Rudy. The objective of the center is to empower the farmers with knowledge and skills neeed to increase agriculture productivity. This is done through spreading awareness about modern scientific methods, practical demonstration of crops and farming equipment. The health of the farmers and their families suffers due to lack of nutritional food. To overcome this problem, we are implementing UPL Bori Baggicha. We have helped the farmers prepare kitchen gardens. The simple methodology is demonstrated to the farmers and the required material (a plastic bag called Bori and seeds of vegetables) is supplied. The farmers are encouraged to grow vegetables like Bottle Gourd. Bitter Gourd. Cucumber etc. This technique is very simple and requires only 1 litre water per day. It costs around INR 25/- per BoriBagicha and in return produces vegetable worth INR 500/- in a crop cycle of 3 to 4 months. This program has given immediate results and has fulfilled the nutritional requirements of the tribal families of Dang. This is also a step to supplement the nutritional requirement of the farmers. The Moringa or Drumstick is considered to be a super food which has multiple benefits. It is a great source of vitamins A, C, iron, Potassium, Protein and calcium. These trees grow easily from seeds or cuttings even in difficult conditions within 8-10 months of planting. The farmers are made aware of the benefits of including Moringa in their diets. Seeds are distributed and farmers are encouraged to grow Moringa. More than 100 farmers across 9 villages in Dang district have planted Moringa and are reaping its benefits today. All our animal husbandry initiative are conducted with the help of village level volunteers called Pashu Mitra (friend of animals). In Dang, the focus of the animal husbandry program is on dairy development. A 3 day training was organized at the UPL Centre for Agriculture Excellence (in collaboration with KVK Ambethi), which focused on selection of milch animals, Al, fertility improvement, vaccination, mastitis, calf rearing & diseases, fodder & nutritional importance etc. Animal health camps have been conducted in 10 villages and medication was provided for diseases and health issues. Empowering the farmers in Vapi started in 2016. This project aims to work with the farmers in Vapi area and transform the way they have been doing farming since ages. 10 farmers groups have been formed with 208 farmers in Vapi cluster. All the initiatives are undertaken through the farmers· group. 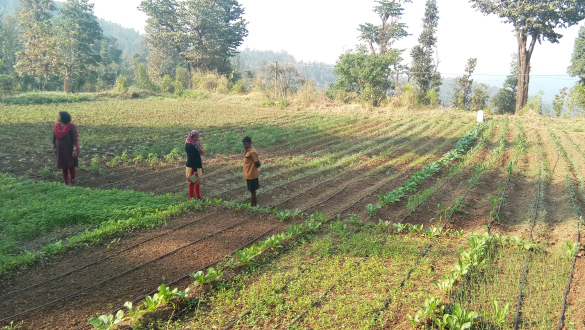 10 field training programs were organized during the year helping the farmers see for themselves the benefits of al ternate methods. 15 exposure visits to progressive farms were organized benefitting 355 farmers. We are also encouraging and supporting the farmers to plant Saru (Beefwood) in their lands. Saru is a very fast growing, tall tree that is capable of withstanding coastal winds (Vapi being a coastal area). Its timber is also useful for making huts and cottages. 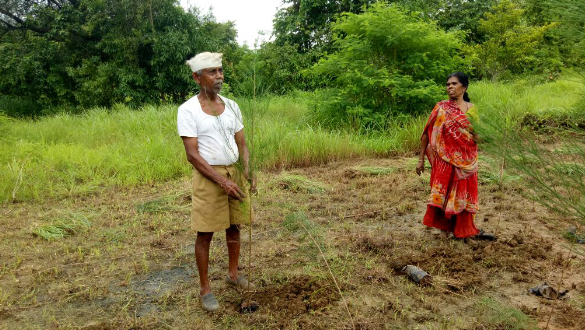 25 farmers participated in this initiative and planted 40,000 Saru plants. 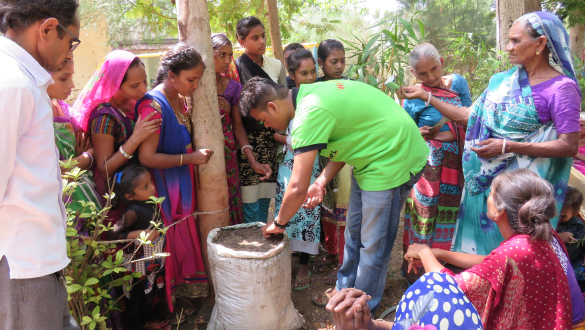 Training on effective goat rearing practices are organized for the tribal families in Vapi.These are small and marginal farmers whose livelihood is entirely dependent on very small land holdings. Many are landless farmers too who work as farm labor. 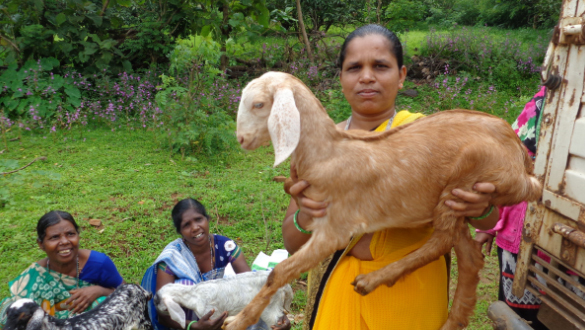 In this scenario, Goat rearing for this group becomes an important source of supplement income. Our program focuses on ways to improve the quality and quantity of milk and improve the health of cattle thereby increasing its utility. All our agriculture development initiatives are driven by farmers groups, to sustain the same in the long run and get community participation at all the stages. Various training programs are conducted to equip the farmers with the latest farm technologies. They are also taken on exposure visits to progressive farms. Promoting the use of micro irrigation to grow vegetables - we are promoting the use of micro drip irrigation in the project areas to grow vegetables. This is an efficient way to maximize the use of water and reduce wastage while giving the plants deep root watering. The use of this system keeps the vegetable plants watered at a slow rate. 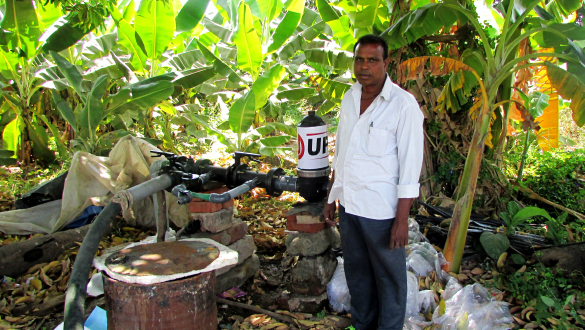 This is a cost effective way to irrigate the plants and around 100 small and marginal farmers have adopted this system with financial support from UPL. Taking good care of our cattles! We are implementing the Animal Husbandry @ Ankleshwar. We have initiated breed improvement program through artificial insemination (AI) in Ankleshwar. We have established industrial skill training center (Known as UPL Niyojaniy) for dropped out youths in the year 2014 with a vision to provide Comprehensive 6 month skills training on industry specific skills like welding, fitting, electrical etc. We have 4 centers and till date we have trained 1,074 youth and 640 have been placed in different industries. We have also partnered with 2 ITI's (Industrial Training Institute) under Public Private Partnership model (ITI Surat- Mahila & ITI Amod).This would enable us to share our industrial expertise and technical know-how with these institutes and help them become better. 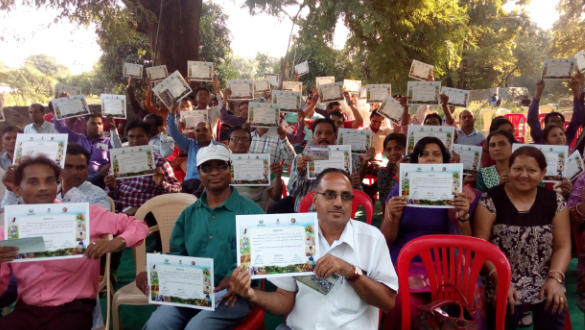 AdarshMitra Training with AFS team on creating awareness on Farm Mechanisation. This year a total of 13 training session were conducted. 600 youths received training on farm mechanisation and 175 candidates were selected as Machine Operator (160) and (15) Officer. We are working on formation and strengthening of Self Help Groups (SHG) and by promoting entrepreneurship in these groups. We have formed 88 women SHG with 1,307 women members from 34 villages under UPL Udyamita. The SHG's are working on various small enterprise like Garments, Agarbatti, Artificial Jewellery, Handicrafts, Jute work etc. We are also providing Skill Based Entrepreneurial training to enhance individual employbility among the women/youth. We follow an integrated approach which incorporates technical skills training, entrepreneurship development and life skills. 15 trainings were organized benefiting a total of 854 participants from Valsad, Bharuch and Ahwa. We are also working on Micro Enterprise Development and Entrepreneurship Development for Tribal Youth and Women with 76 participants. Decreasing in forest cover, increase in insensitivity towards nature, over exploitation of natural resources and other man made hazards to nature have disturbed the ecological balance. UPL Vasudha is our environment and nature conservation initiative to improve the quality of life of the natural habitat in the region through information dissemination, increased awareness and focused efforts to preserve and protect the same. We work for afforestation and rehabilitating the degraded forest and common lands. We have been successful in getting active community participation in the project. Under the initiative, the community is encouraged to plant trees in village common lands, government wastelands and panchayat land. This would raise the plantation level in the area. 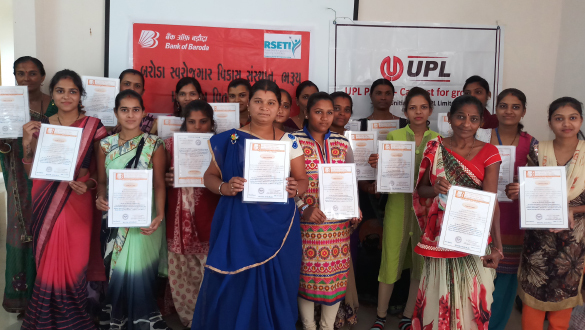 The UPL team is actively working with the Gram Panchayats in Ankleshwar, Jhagadia, Dahej and Vapi clusters where the project has been implemented. Apart from tree plantation, we have also done bore wells, set up solar system and water pumps at the sites for proper growth of the plants. Regular monitoring of the social forestry sites is being conducted by the team and volunteers. We are also conducting surveys to locate new sites for further plantation. 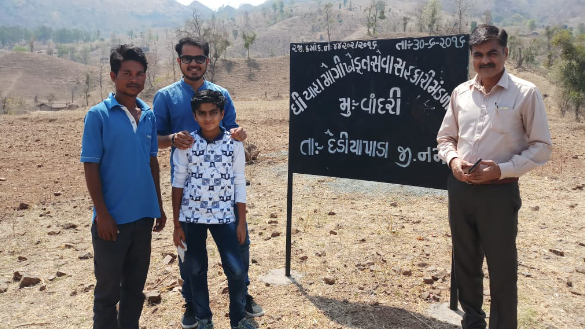 This year Dahej was selected as a new site for social forestry. Weed control exercise is being carried to ensure good growth for the trees. Micro irrigation system are installed at the sites. As of March 2018 we have planted 39,100 trees in 80.5 acre of community land. We have provided 26,495 to community school for 60 acre plantation and work with them for survival. Mangrove plantation was undertaken to prevent soil erosion and help reclaim land from sea. Our WAU volunteers and the community planted Mangrove in the coastal areas of Vagra block. 120000 have been planted spread across 60 acres in the region. Sarus Crane (Grus Antigone) is a resident species of Gujarat mostly found in Kheda, Anand and Vadodara district. This species faces extinction due to man-made constructions and activities that erode its nesting and breeding sites. Habitat loss becomes a threat to their existence. Sustainable efforts to protect and conserve the species calls for long term solutions involving the community. Awareness programs are conducted in the major breeding, foraging and roosting areas for preserving the species. 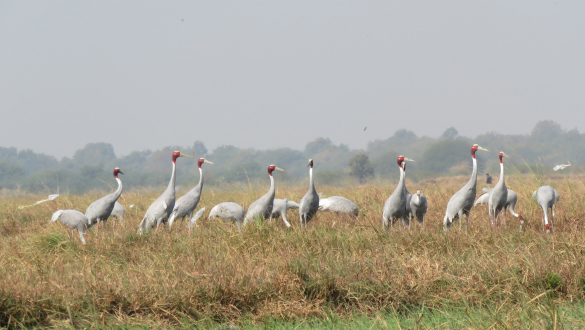 Initiatives undertaken: Documentation and survey of Sarus Crane (number and habitat). Creating awareness amongst students and farming community about Sarus Cranes, their habitat and importance. Have done 73 awareness programme covering 5,884 students, 258 teachers & 1,500 farmers. Formation of Rural Sarus Protection Groups. Documentation and publication - complete report on the conservation efforts was also prepared and the same was released by IUCN on 4th December,2017 in New Delhi. In 2012-13. 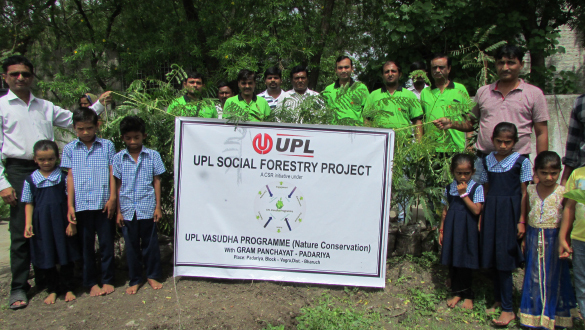 UPL formed 20 Eco clubs in schools around Vapi. As of March 2018 we have formed / Activated 65 EcoClubs in community School with 5058 students. A group (10 students) of enthusiastic, environmentally concerned and socially committed students are chosen from each school as Eco Club members. These EcoClub members are involved in taking up meaningful environmental activities and project in their respective schools and vicinity. They manage the green activities such as growing trees, developing medicinal garden, cleaning-up activities such as collecting waste recycle and reuse. The Eco Club members are also actively involved in the conservation of locally threatened Fora and Fauna. Through Eco Clubs our focus is to form a cadre of environment warriors through which students can reach out and influence and engage their parents and neighbourhood communities to promote sound environment behaviour. Major activities were Handprint Count - "Positive Action towards Environment Sustainability" Handprint count was carried out in 13 schools wherein 1675 students participated and 159 students left their handprint.Students of Eco-Club were taken on a nature trail to herbal garden at Zandu Foundation (District-Valsad, Gujarat) where they learnt about a variety of herbal and aromatic plant species with help from the Foundation. The objective of this activity is to sensitize young minds about their action towards environment sustainability. Every action of ours has the potential to impact the environment either positively or negatively. Through this activity, the children are encouraged to assess how their actions impact nature. 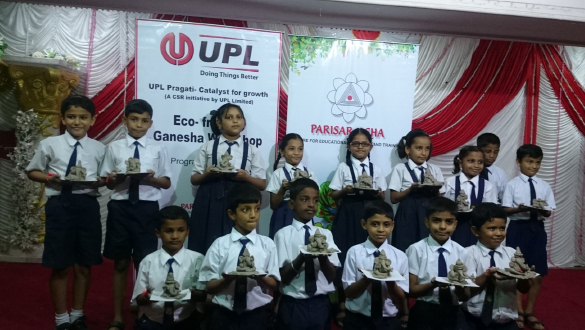 UPL in partnership with Parisar Asha (a Trust working in the field of education research and training based in Mumbai) has been organising Green Ganesha workshops for school children in Mumbai. This is a unique workshop where school children are taught and encouraged to make their own Ganesha idols using eco-friendly material (river clay popularly known as "shadu mati" in India). Ganesha idols are in huge demand during the Ganesh Chaturthi festival. Once the festival is over, these idols are immersed in various water bodies like lakes, rivers and ocean. Since most of the idols are made of Plaster of Paris (POP). It causes great damage to the water bodies. During the workshop, we also impart knowledge to the children about the ill effects of using POP idols. Children are encouraged to use the Ganesha idols made by river clay during the festival and promote its use in their neighbourhoods. In last 3 years we have conducted workshop in 56 schools in Mumbai and have sensitized 6050 students about the ill effects of POP idols. Established in year 1972, Completed 46 years of service towards providing quality education in south Gujarat. THE TOP MOST SCHOOL of area having almost 100% result (Every year) with focus on holistic development of student. Gujarat being a hub for chemical industries in India requires quality manpower to run the industries and fuel its growth. 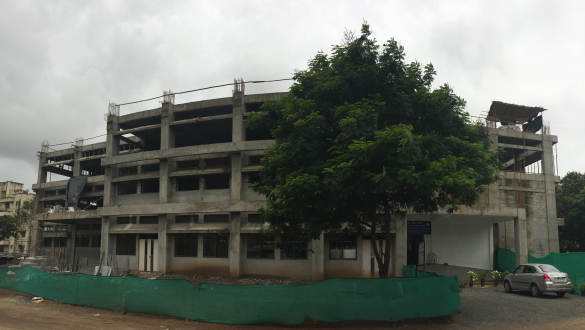 The GIDC (Gujarat Industrial Development Corporation) belt in Ankleshwar did not have a technical institute that could cater to the growing need for manpower by the industries. In this scenario, UPL decided to come forward and establish a world class institute with research and technical facilities at par with the best in the region. 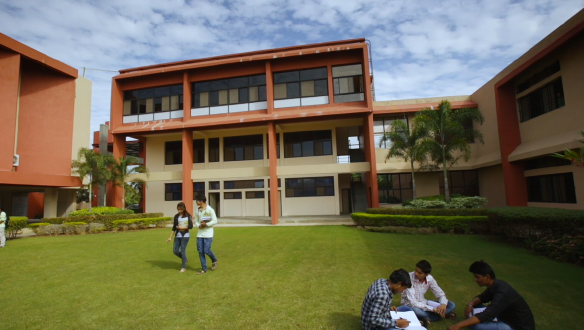 The institute provides world class research and learning facilities to the engineering students as well as the faculty who are engaged in active research. The laboratories are provided with latest equipment which stimulates learning. The institute regularly organizes workshops, engineering seminars, training programs etc, for the students. For the overall growth of the student's personality, the institute organizes various life skills program on a regular basis. The quality of health care in any hospital is dependent on medical professionals and the facilities available. Hospitals are always in need of good quality nurses who are not only skilled in their profession, but are also caring and passionate about their work. SSRCN aims to fill this requirement of hospitals and nursing units. 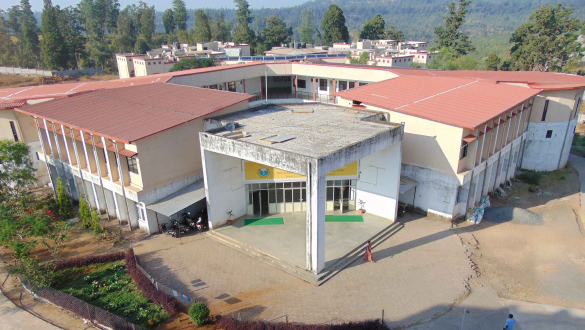 The college was established in the year 2003-04 and has an intake of 40 students in the graduate program and 15 students in the post graduate program. The college is working towards launching M .Phil and PhD programs too. Another important objective for starting this college was to provide young girls education, professional degrees and life skills to become financially independent. The institute is well equipped with latest medical technologies and good infrastructure to enhance the learning environment of the students. The students also get trained in several specialty and super specialty hospitals. Seminars and workshops, extracurricular activities, events etc. are organized regularly. Our students have been doing very well, both as care givers in hospitals and as academicians in nursing colleges. 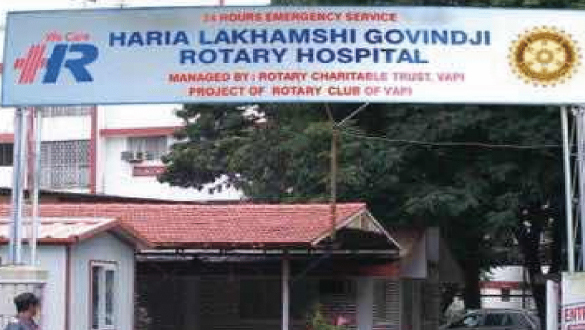 The hospital was started in 1977 with the active support of UPL and is today managed by the Rotary Charitable Trust. This hospital provides good quality healthcare especially to the needy people in the region. It is a 250 bed multi-specialty hospital with one of the best infrastructure facilities in the region. 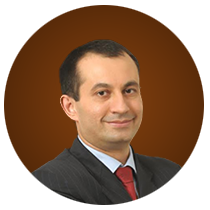 It is managed by a team of dedicated and expert professionals. Equipped with fully functional operation theatres, trauma and emergency centres, blood bank, dialysis centre, physiotherapy centre and much more. The hospital is equipped to handle all kinds of medical emergencies. 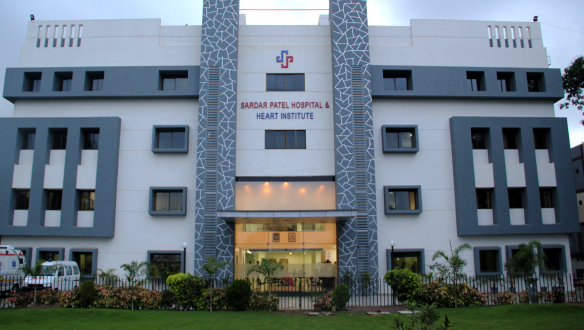 This hospitals caters to the medical needs of people from Ankleshwar, Panuli and Jhagadia belt. It is supported by UPL and is committed to provide quality and affordable health care to the economically disadvantaged sections of the society. At present, the hospital has a capacity of 100 beds and is equipped with all modern medical facilities for giving people the best treatment. 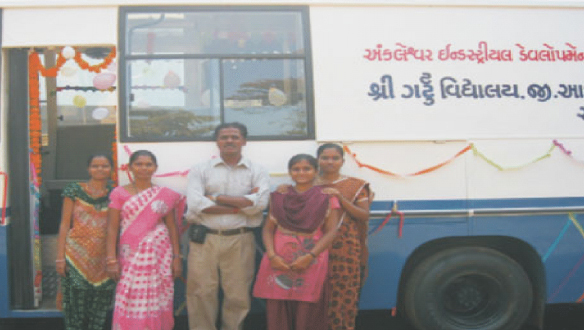 Around 2 lakh people from the surrounding region avail our medical services every year. In lieu of Govt. 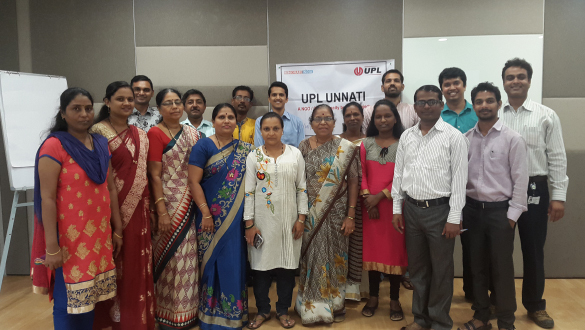 of India's Swachh Bharat Abhiyan, UPL decided to do its bit in this direction. We started the School Sanitation Program 3 years back and have built quality toilets in schools and public places. These toilets are provided with adequate drainage facility, availability of water and proper cleaning mechanism. To improve the overall sanitation environment in the rural areas, we conduct community awareness drives about hygiene practices and behavior. These programs are mostly conducted in schools so that children become the torch bearers of cleanliness and spread the message in the community. As of march 2018 we have completed construction of 36 toilet blocks. Girl Safety Training - Safety of girls is of paramount importance. 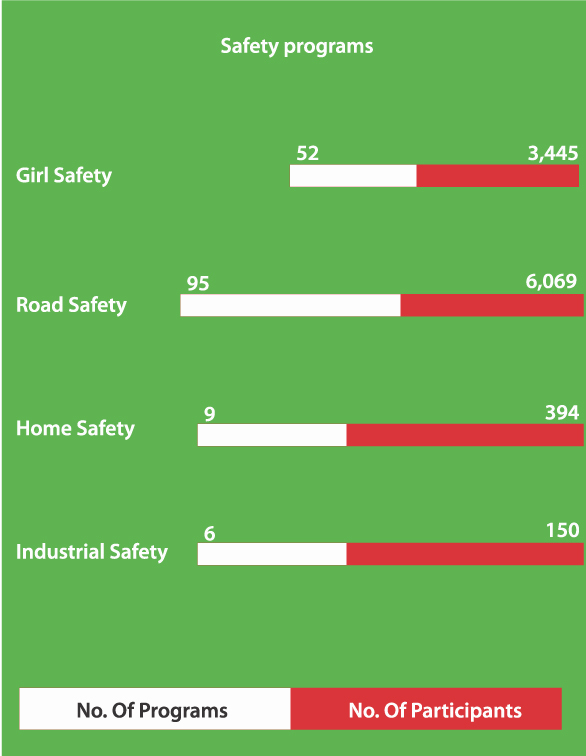 Through this initiative, we attempt to make the adolescent and young girls aware about various aspects of safety. They are equipped with knowledge and skills to protect themselves in case of any untoward incident. They are encouraged to take guidance from family members and teachers and hence, avoid harm. Self- defence techniques are also taught during the sessions. Road/Highway Safety Training - A majority of the accidents on the road happen because people do not follow road safety rules. Either there is a lack of awareness about the same or simply an attitude of negligence. We work with schools, colleges and housing societies providing training and creating awareness. Home Safety Training - Many accidents at home go unnoticed like accidents in kitchen, electric shocks, trips and falls, harm from hazardous material etc. In our home safety trainings, we make the women aware about these hazards and encourage them to follow safer practices at home. Industrial Safety Training - This program is conducted with the ITI students who are going to join the industrial workforce in the future. It is imperative to prepare them for a safe work life in industries. Use of safety equipment at all times, do's and don'ts within the industrial unit., measures to avoid industrial accidents and what to do in case of an accident are the focus point of the program. The Muktl Dham at Vapi is constructed with major financial support from UPL and provides a cremation facility which Is pollution free and eco-friendly. It is the first of its kind in the region. The crematorium operates a website that offers a platform for people to live-stream last rites of their loved ones to their family members and friends who are far off and are not present physically. 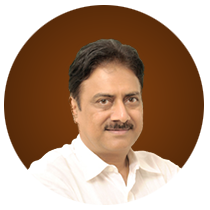 Our Chairman Mr. R.D.Shroff inaugurated the Mukti Dham. 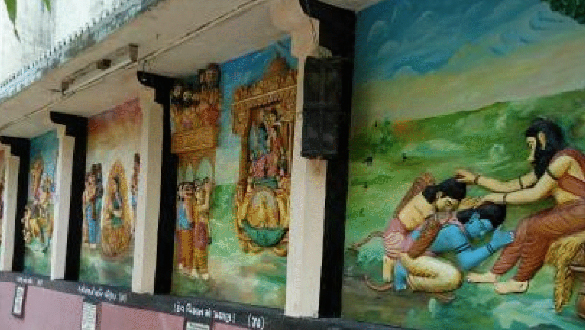 Shree Sharda Vidhya Mandir in Kadodara, Dahej provides higher education to 7 neighbouring villages. The school was built 40 years ago and in the absence of renovation it had become dilapidated. On request from local leaders of the village, UPL constructed a new building for the school ensuring children to get a safe and conducive environment for studies. UPL believes in creating capacities of civil society organizations including Non Govt. Organizations (NGOs) and Community Based Organizations (CBOs). These organizations have strong community connect and bring their expertise to the table. Some of them need to improve their processes and systems to enhance their effectiveness. UPL Unnati is a step in this direction. Through this program, we work on enhancing the administrative and management systems of the civil society organizations in order to improve their project deliverables. The supply chain team of Advanta Seeds distributed bags and water bottles to the school students of Jalna village in Maharashtra. They also held a discussion with village stakeholders (parents. teachers. opinion leaders. panchayat members. media etc) on the ill effects of child labor and how to overcome this menace in our society. The production team is conducting similar development initiatives in the neighbouring areas too. Global Parli was started as a pilot to showcase how villages of India can be transformed into model villages through revival and empowerment. The idea was to create progressive, economically viable and prosperous villages for a new India. This project is being implemented by "Global Parli" team under the leadership of Mr. Mayank Gandhi. UPL is supporting the Global Parli to develop replicable model of Rural Rejuvenation by providing financial, technical & management support to the project. 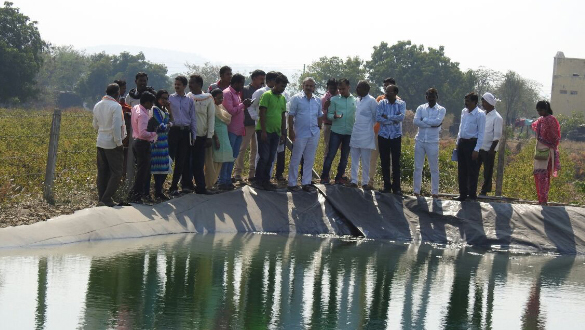 The project works with 15 villages in drought-prone Parli tehsil in Marathawada (Maharashtra-India) for over-all development. 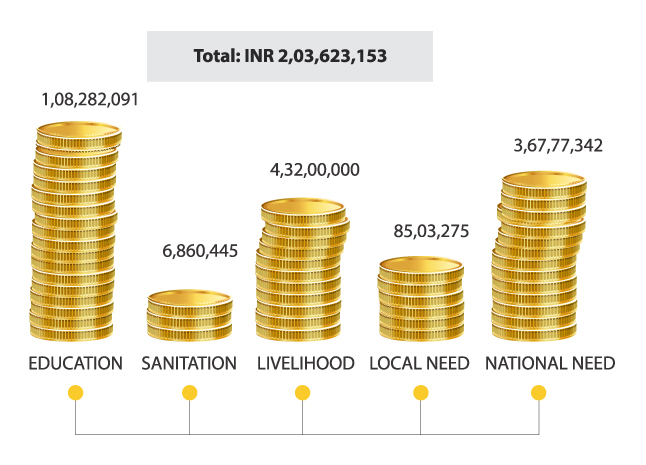 The primary goal is to increase the per capita income of each family by 250% in 3 years. Established in the year 1989 at Kolkata, friends of Tribals Society (FTS) is a non-governmental voluntary organization committed towards the upliftment of the deprived in rural India. It believes that literacy is the key to progress and hence, focuses on healthcare education, developmental education, empowerment education and basic education to the rural children. 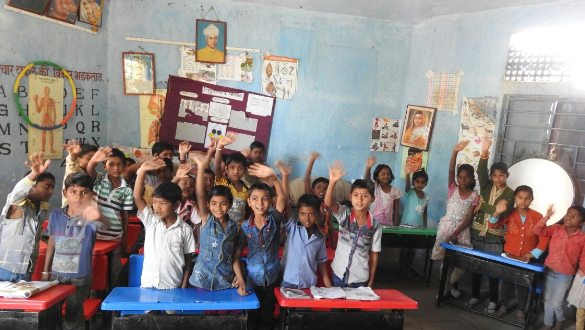 They have a wide network of 32 chapters all over India to serve the villagers in a better way. Today, they are working with 29,587 schools and 7,83,689 students. 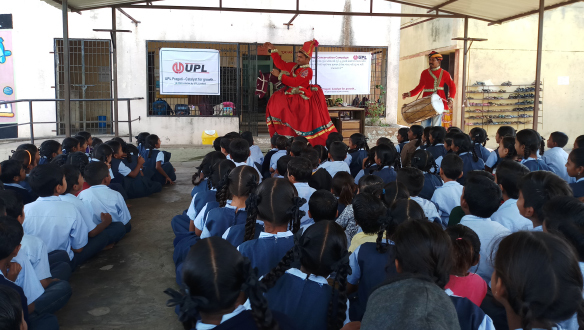 UPL has been providing financial support to the program. This project aims to make learning fun-filled and experiential based for the village school children and teachers. A van equipped with educational support systems like audio visuals, sports equipment, children films, science laboratories, education aids etc, visits a village school twice a month and spends 2 days with the children giving them exposure to interesting ways of learning. Today, we are working with 25 rural schools through 2 education vans. UPL promotes the spirit of contribution to society amongst its employees. We believe that every employee must be given an opportunity to put their skills and passion for the larger goal of development, beyond the realms of their work life. We are United Volunteers lovingly known as WAU team have always come forward and given their best. They have been instrumental in spearheading many programs in the neighbouring communities. In year 2017-18 total 125 WAU volunteers have spent 3,123 hrs for CSR work.